Looking back on my experiences, now I can laugh. It has been a long tough road to get to where I am today. Going through high school I always told everybody I would play professional football but I never would have thought it would have been in Europe. With that being said, I am very happy with my decision to play overseas, the experiences I have had, and even better friends I have made. I played two years of football in Europe and each experience was completely different. It all started when I was 7 and wanted to start playing football. As the years passed, I fell in love with the game, and I took it extremely seriously. Once I hit high school I was a well-known player around my area. During my senior year, I received a full ride scholarship from Division 2 St Paul’s College. I attended training camp and left early due to the fact that the school was closing and very unorganized. That was the moment I thought my chance to play professional football was over. After returning home I joined a semi-pro team, the Virginia Cyclones. Toward the end of that season, I found out about the opportunity to play in Europe. At first I was a little skeptical, but after creating my profile and getting a membership I began to receive interest from teams. Before I knew it, I was on a plane and about to begin my career in Europe. My first season was in Germany with the Tollense Sharks. The team was located in Neubrandenburg, Germany and was extremely small with only one night club, and I could walk from one end of the town to the other in no time. I was the first of two import players the team was going to bring over, and I was the first ever import player the team had ever signed. I had absolutely no idea what to expect before arriving. There were a few hiccups initially made by the team. The first mistake was bringing us in after the season deadline for imports, so we had to sit out the first 5 games of the season. The team played in the German 3rd league so not every team in the league had import players. The next thing that went wrong happened at the end of the season when I found out that I was over my 90-day pass in Germany, which had me living illegally in the country. Luckily, when it was time to go home, customs looked past that. I also learned a lot of do’s and don’ts of German culture and international travel as an import player. After taking the 2013 season off, I decided I was ready to return to playing football. 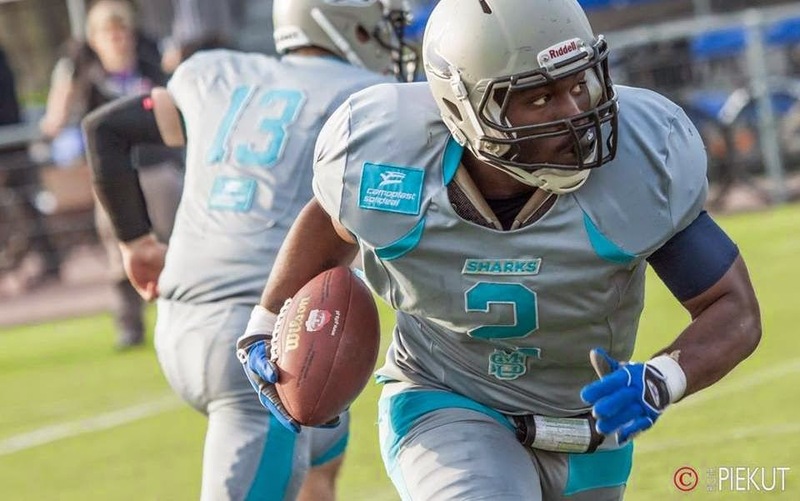 This time it was with the Warsaw Sharks in Poland’s top league. This was a completely different experience on and off of the field. Off of the field, Warsaw was the biggest city I have ever lived in. I’m originally a small-town fellow. I had to get used to the public transportation. Sometime I would have to take the bus, “tram” and subway just to get to where I needed to be. There was always something to do or someone famous in town. A funny experience I had was when the rapper, 50 Cent, was in the mall and everyone thought I was in his entourage! I took a lot of pictures and signed a lot of autographs. The security didn’t even know if they should let me on stage with him. LOL! On the field, every team I played against had two or more imports. This made it extremely hard to win when I was the only import on my team. The team was definitely better than the previous season, but we just could not find that win we needed. During the season, I was also able to go to school and talk with kids about life in America, as well as show them some of the basics of football. This was the best part of my time in Poland. The idea of having an impact on someone else’s life, big or small, made me feel like I was making a difference. In all, these experiences have changed the way I thought about life outside of America, and have shown me that my highest dreams are attainable, even though they’ve arrived in a different form from what I could ever imagine.